Did everyone watch Project Runway last night? Well if not, proceed with caution ... because there's a SPOILER AHEAD! I am so glad Kenley didn't win. Between Korto and Leanne, I wasn't too picky -- but Leanne's collection was definitely more innovative, so kudos to her. And now on to more important matters ... my fave products of the week! I've been super-stressed, so I've been lusting after products to relax and calm me. And what better way to do that than by lighting a delicious scented candle and settling back on my comfy couch? These are the two that have been, well, lighting up my life this past week. 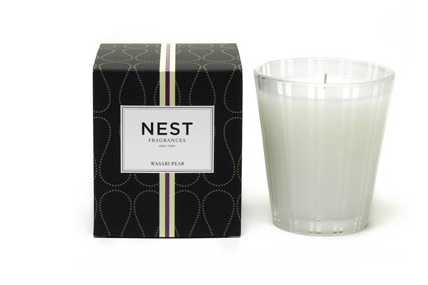 NEST Wasabi Pear Candle ($32 at bergdorfgoodman.com): Wasabi pear? That could be trouble. But you know what? It smells absolutely amazing. It's just the right combination of sweet and spicy that just fills my apartment with delightfulness and joy. I can leave it burning for hours on end and never get sick of it or feel like it becomes cloying or heavy. The combination of anjou pear, watery ozone and wasabi just hit it out of the ballpark for me. Thymes Red Cherie Candle: I've written about this candle before (click here for full deets), but it deserves another mention, simply because I just can't live without it! It calms me when I'm stressed, relaxes me when I'm tense, and just really makes me feel at ease no matter what the day has been like. Life just feels so much cheerier and happier with this light, airy scent wafting through the apartment. Luckily you will have that chance in just under a week!